I'd been wanting to go to vermont for a very long time. Originally, I made plans with a new online friend, but she fell ill, and I forgot I was flying to Seattle, so I canceled our Thursday reservation. 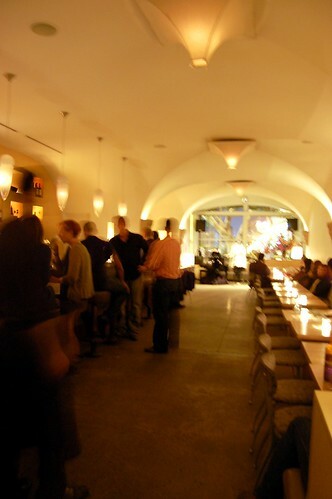 Quite serendipitously, however, Giggles had already made a Monday reservation at vermont and needed a date. Kismet! 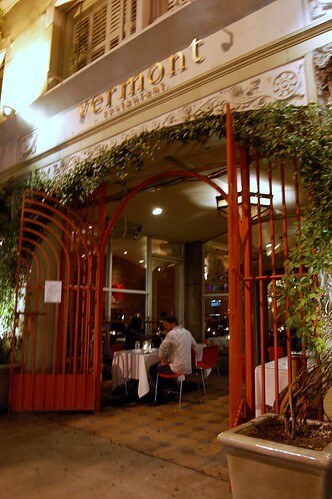 And vermont's dineLA deal was only $34! 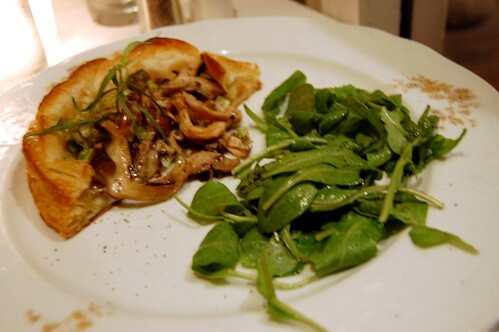 Giggles enjoyed her mushroom and leek tart with organic greens. 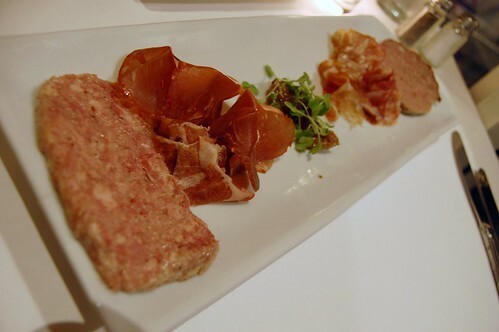 I began my porktastic adventure with a charcuterie plate with serrano ham, pork rillete, copa, and country pate served with cornichons. Hog heaven. Literally. 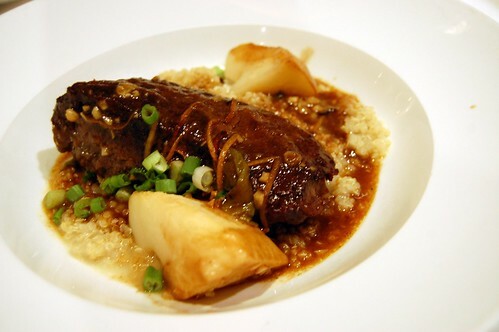 Giggles happily dove into her beef short ribs on a bed of celery root and quinoa infused with citrus zests. My bite was luscious and rich. Very good. My piggy path continued with pork marinated in cocoa and honey and slow-roasted with mashed sweet potato and beet tarragon salad. Oinkerrific. 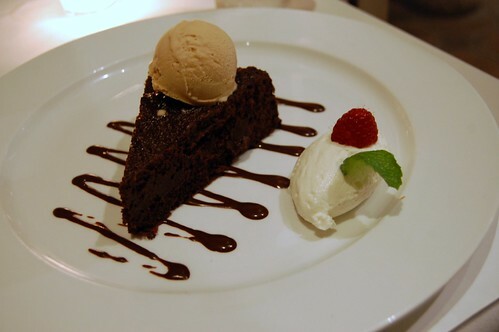 Giggles ended with a lovely chocolate decadence cake. 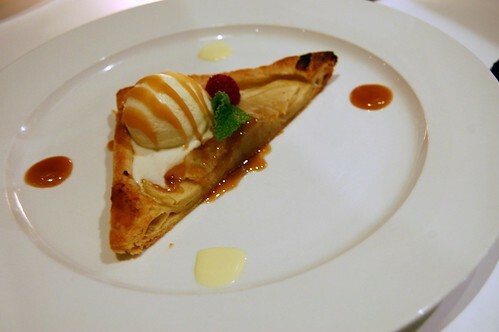 I snarfed up my warm apple tart even though it did not have pork in it. I loved loved loved this hallway to the rear parking lot. Delightful experience. I look forward to a return visit. So jealous-as much for the company as the good eats! 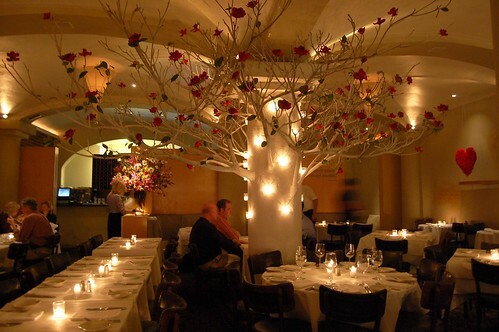 Love the dining room tree. I have also been eating a lot of pork lately. 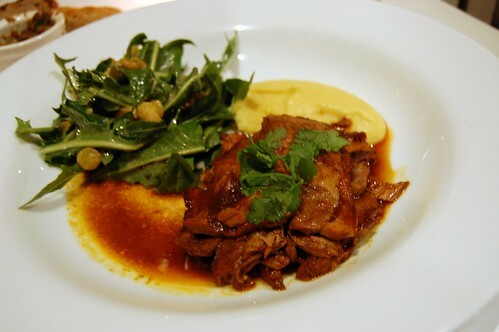 Last night we went to a "modern Vietnamese"
restaurant, and I ordered a pork belly starter. It was TDF and I thought of you, as I had never ordered pork belly before but knew you loved it. Awesome. I could eat it every day. Then I had a traditional Vietnamese broken rice dish topped with two kinds of pork and a fried egg. Loved it. And LMAO at dapotato's comment! I'm laughing because that first thing on the Hog Heaven plate looks like spam. Everything looks so bomb. Tater - you clown! Poor piggily wiggily. 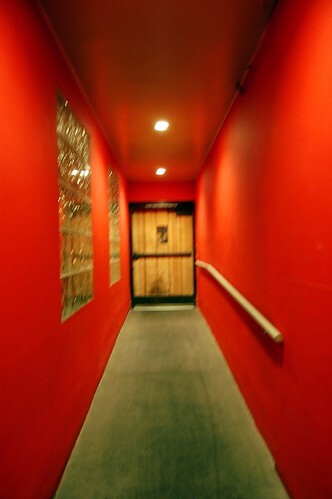 Nice red hallway. We both ate country ______ recently, eh? 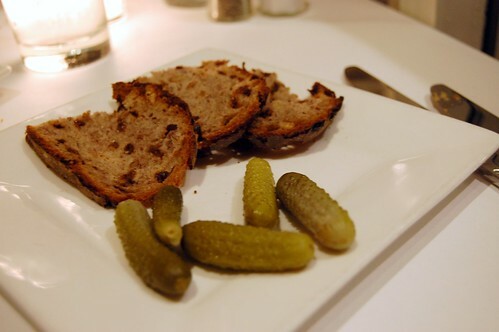 you had me at porktastic. you know this. that is indeed piga-licious food!